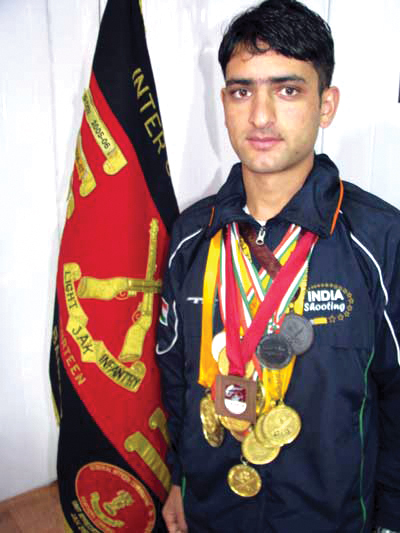 A rifle shooter Chain Singh from a pastoral village in Doda District has made himself and his people proud by bagging six gold medals in the ongoing 12th South Asian Federation (SAF) Games being held at Guwhati Assam. Singh was born and brought up in a modest family. Son of a farmer, he received his education from government run schools in this his home district. In his individual events, Singh defeated ace rifle shooter Gagan Narang who had won bronze medal in London Olympics. Chain Singh won all the events he participated, both at team level as well as in individual performances. Singh has already made his name by winning a bronze medal in 17th Asian Games held in Incheon, South Korea in September, 2014. He has also secured his spot for the Rio 2016 Olympics.